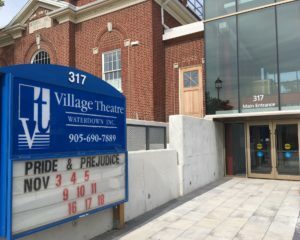 Village Theatre Waterdown Inc (VT).- “live theatre in the heart of Waterdown“- is community theatre that performs at historic Memorial Hall located in the downtown core of Waterdown, Ontario. VT produces challenging and entertaining dramas, comedies, thrillers and mysteries for lovers of theatre and newcomers alike. Since 1973, VT has provided a creative outlet for hundreds of volunteer local actors, directors, designers and crew to express their ideas and share their passion for the performing arts. VT is proud of our established reputation as a group of volunteers that fosters a unique cultural experience within our community, with memorable productions by playwrights such as Dario Fo, Michel Tremblay, Tennessee Williams and Anouilh with plays like Top Girls, Equus, A Streetcar Named Desire and Love For Love. VT is continuously introducing culture to new generations. Village Theatre Waterdown actively seek young people to perform, volunteer and learn the art of theatre. Hamilton Community Foundation, provided by the Alfred & Joan Robertson Memorial Fund .